The iconic Swing Bridge which is celebrating its 150th anniversary in 2018 has been extensively renovated by the Port of Tyne. One of the most well-known of the seven bridges across the Tyne linking Newcastle and Gateshead, the Swing Bridge is an icon of Victorian engineering and one of the few mechanised bridges still operating for twenty-first century traffic. Originally designed by John Ure, resident engineer of the Tyne Improvement Commission (the predecessors of the Port of Tyne) – the bridge constructed by Sir W. G. Armstrong & Company took eight years to build and first opened for traffic in 1876. 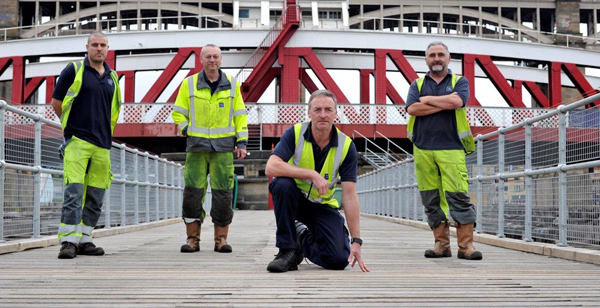 As a Partner of the Great Exhibition of the North, and as a lasting legacy of the exhibition, the Port of Tyne has invested £200k in restoring the timber decking, and more than 25,000 hours of work and over 10,000 screws went in to repairing the grade II listed bridge which is also classed by Historic England as a Scheduled Ancient Monument. Andrew Moffat, Chief Executive Officer Port of Tyne, said: “As part of our support for the Great Exhibition of the North, we decided to bring forward restoration work that would have otherwise taken place over a number of years. The Swing Bridge is operated by the Port of Tyne and kept in working order by its skilled engineers who often need to make the unique parts themselves. Restoration work to the historic timber decking by the Port’s engineers and joiners has taken some seven months to complete.